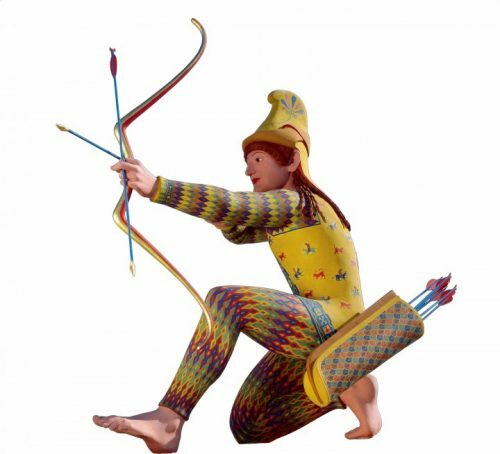 Reconstruction B of a Trojan archer, 2005. Original: Greece, Aegina, ca. 480 BC; Glyptothek Munich. Copy: synthetic marble cast with natural pigments in egg tempera, lead, and wood, 37. in. (96 cm) height. Liebieghaus Sculpture Collection (Polychromy Research Project), Frankfurt, on loan from the University of Heidelberg. The November 2017 opening in San Francisco of an updated version of the 2003 Munich Glyptotek’s Bunte Götter or Gods in Color, was a shock to the senses of museum viewers. The original Glyptotek show was the first major public exhibition of recreations of classical statues in their original colors. Greek and Roman artists did not consider their sculptures complete until they had been brilliantly painted. The ancient Greeks would have found the stark white marble sculptures displayed in our museums as disturbing as these painted plaster reproductions are to modern audiences. Reconstruction of the so-called Chios kore from the Akropolis in Athens, 2012. Copy of the original: Athens, ca. 500 BC. Crystalline acrylic glass, with applied pigments in tempera. Liebieghaus Skulpturensammlung, Polychromy Research Project, Frankfurt am Main, acquired 2016 as gift from U. Koch-Brinkmann and V. Brinkmann. Innovative techniques pioneered by Vincenz and Ulricke Brinkmann, along with an international team of researchers, revealed the original condition of once-painted sculptures that have long since been worn down to bare marble. Analysis detected not just remnants of pigment on statues, but traces of decorative patterns on their surfaces. The researchers’ findings allowed them to create a series of colored reproductions of ancient statues, in strict compliance with the evidence they found. 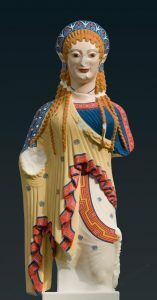 Research into the original appearance of classical statuary is ongoing, and stylistic variations in coloration across periods and regions complicate the work of researchers. 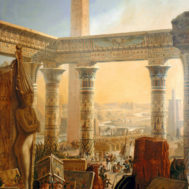 The recreations in “Gods in Color” have been painted only with the shades and patterns suggested by physical evidence on the original statues. Other exhibitions have been more willing to make tentative guesses about the statues’ original appearances, based on the evidence of the use of color in other surviving works of classical art, such as mosaics. One alternative approach was taken by the 2011 exhibition at Stanford University in California, “True Colors: Rediscovering Pigments on Greco-Roman Marble Sculpture,” led Ivy Nguyen, an undergraduate student in chemical engineering at the university. Nguyen’s team made an attempt at a reproduction of an ancient statue as it originally appeared, first using analysis to detect the base colors, and then making an “educated guess” at the shades of other layers of paint, now wholly lost, that may have given the statues’ colors more subtlety and variation. The lurid colors, flesh tones, and psychedelic patterns of the clothing and reproductions are a far cry from the calm, cool white marble we associate with classical art. Museum visitors, curators, and art historians alike were astonished by what they saw in Munich. And they have continued to be astonished. For more than thirteen years, variations on the exhibition have toured the world, and met with shock and awe at every location, from the Vatican to Athens, and from Istanbul to Madrid. This autumn, the exhibition opened at the Legion of Honor in San Francisco. Max Hollein, curator of the exhibition, anticipates that attendees will be “shocked and startled” by the sight of Greek and Roman statues sporting their original colors and patterns. Judging by the precedent set by earlier exhibitions, he is probably right. Yet the fact that Classical statuary was colorfully painted ought not to be so surprising. For centuries, scholars have known that the Greeks and Romans always finished their magnificent carvings with a layer of brilliant color. In 2008, Smithsonian Magazine published an article on the Brinkmanns’ work, and pointed out that the true nature of classical statuary has been an open secret for centuries. 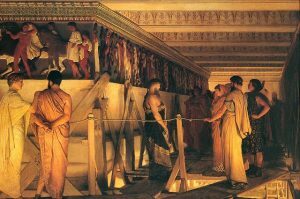 In 1869, Victorian painter Lawrence Alma-Tadema’s depicted a famous marble frieze as it might once have been, fully colored in deep reds and ochres, in his work Phidias and the Frieze of the Parthenon. His contemporary, sculptor John Gibson, produced a Tinted Venus (1850-51), which emulated the coloring practices of the ancient Greeks. Despite the long-standing and widely accepted evidence to the contrary, our conception of classical art remains monochromatic. This persistent misconception, as well as the surprise with which the painted reproductions are constantly greeted, are understandable. The vast majority of classical art in museums is unpainted stone. There are exceptions: the aforementioned porous works in soft stone or pottery with patches of surviving color, and other pieces in bronze, or colored marble and granite. Yet overall, white predominates in our halls of classical statuary, in our textbooks and our films. Lawrence Alma-Tadema, Phidias Showing the Frieze of the Parthenon to his Friends, 1868, Birmingham Museum, UK. The Painting shows at left the North frieze slab XLVII and the West frieze Slabs I and up visible at right. Among the spectators, critics have identified Pericles, the bearded man facing Phidias. Next to him is his mistress, Aspasia. In the foreground stands a boy, Alcibiades, with his lover, Socrates. When ancient sculptures were first excavated in fifteenth century Rome, they emerged from the earth largely stripped of their original colors. The great artists of the Renaissance, and all subsequent generations, took these white stone remnants for their models of the artistic ideal, and produced their masterpieces in snowy marble. Neoclassical architecture, too, restricted itself to the use of white marble (or imitations of the same in brick and plaster). Early modern scholarship reinforced the image of Greek and Roman art as stark and colorless. Johann Winkelmann, an eighteenth century scholar widely considered one of the founding fathers of modern art history, adhered to a view of classical art, and Ancient Mediterranean culture in general, that was largely defined by its pure, unmodulated whiteness. The whiteness of their marble was associated with the intellectualism of the Ancient Greeks and the supposed civic virtue of the Romans. Today, however much we may respect the achievements of Greek and Roman culture, we do not venerate them as we once did. 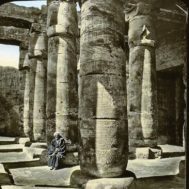 Historians and archaeologists have developed a more complicated and nuanced vision of the Classical world. Yet our conception of Classical art remains monochromatic. The persistence of our sixteenth-century conception of ancient sculpture in the twenty-first century exemplifies the power of the visual to overwhelm the merely conceptual. We may know that ancient sculpture was colorful, but we do not envision it so. We envision classical art as white, because it is in that form that we invariably encounter it. The example of the Gods in Color exhibition is a potent reminder of the essential role of museums in the artistic and historical education of the public. It is not enough, apparently, to be told that ancient statuary was in color. We need to be confronted with material examples, before the idea can sink in. 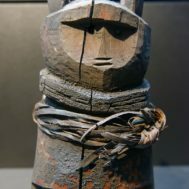 The exhibition also demonstrates how important personal encounters with material objects are in the formation of our understanding of any art form. In order to truly accept that a particular culture or religion produced artworks of extraordinary beauty; we must see them, and know them for ourselves. It reminds us that without public museums to present us with real examples of art from around the world, we cannot learn to appreciate the true diversity and wonder of global cultures throughout history. 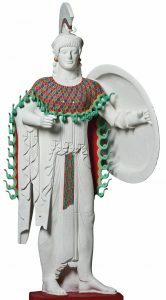 Reconstruction B of Athena, 2005. Original: Greek, Aegina, ca. 480 BC; Glyptothek Munich. Copy: Plaster cast with natural pigments in egg tempera, 67 in. (170 cm) height. Liebieghaus Sculpture Collection (Polychromy Research Project), Frankfurt.